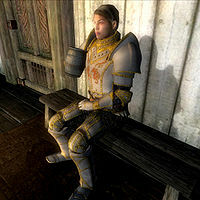 Servatius Quintilius is a Watch Captain in the Imperial City. He takes over Hieronymus Lex's post after Lex is re-assigned to Anvil. Fortunately for the Thieves Guild, Servatius is "a practical man who does not believe in the Thieves Guild or its imaginary grandmaster, the Gray Fox", and thus, unlike his predecessor, does not cause any trouble for the Guild. During Imperial Corruption, in which a corrupt captain extorts half the local market, Servatius will prove just as unhelpful as Lex, but for different reasons. Servatius Quintilius will wear Imperial Watch boots, cuirass, gauntlets, and greaves when on duty. His sleeping attire is a blue & green outfit and a pair of pigskin shoes. In combat he will use his silver battleaxe. He carries a copy of the Imperial Watch Key and the South Watch Tower Key. Servatius carries a small amount of gold and a pair of light brown linens. His duties resemble those of Lex, although he is a bit less on the lookout for potential Thieves Guild members. He sleeps in the South Watch Captain's Quarters every night between midnight and 6am and always starts the day downstairs, socializing with the other guards until his daily routine begins: At 9am, he ventures outside and starts his patrolling near the southern gate in the Arboretum; At 10am, he goes through that very same gate, crosses the bridge to the Arcane University, then guards the gate there. At 11am, he heads back over the bridge, goes through the Arboretum, then enters the Temple District. At noon, he returns to the South Watch Tower and dines for two hours, then returns to the Temple District and positions himself near the gate to Green Emperor Way. At 3pm, he returns to the Tower, checking up on the guards dining on the ground floor. At 4pm, he heads down to the Waterfront, and watches for criminal activity near the Lighthouse. He moves on at 5pm, crosses the waterway, and checks out the pirates near the Marie Elena, at times even boarding the ship. While he is in the District, he might as well take his dinner at the conveniently located Bloated Float Inn from 6pm until 8pm. After another check on the Marie Elena until 10pm, and after a long and busy day, Servatius finally returns to his tower and spends the rest of the evening relaxing until he heads up into his chambers and goes to bed at midnight. When you meet him for the first time and ask him about the Imperial City, he will tell you that he plans to keep a much lower profile than Hieronymus Lex: "I aim to keep an eye on things here in the city. Take it slow, get to know the people. Try not to get off on the wrong foot." During your search for an honest Guard Captain willing to stop Audens Avidius' illegal activities in the Market District, all the guards will point you towards Servatius with the unflattering description: "Go see Servatius Quintilius. He's new and might be stupid enough to try and do something about it." Servatius, however, will prove them wrong: "I've only recently been promoted. I'm not going to cause trouble by filing charges against one of the other Watch Captains. You could try taking your problem to Itius Hayn. Maybe he'll be willing to risk his career by arresting Audens." If you approach him again, he will still point you to Itius Hayn: "If you are still trying to file a complaint against Audens Avidius, go see Itius Hayn. I can't help you." Servatius is Lex's replacement, so he is not supposed to be seen until Lex is re-assigned to Anvil in the Taking Care of Lex quest. However, a bug in the scripting of the Unexpected Voyage quest will cause him to appear when it is completed even if Lex hasn't been reassigned yet, following Lex everywhere as he has exactly the same schedule. Esta página foi modificada pela última vez à(s) 19h17min de 2 de abril de 2013.